At first, the teaching of physics wasn't very good. Both physics and astronomy were taught at the University of Nebraska since the University first opened its doors to students in 1871. However, studying science at that time was considered only as training for the mind, rather than as preparation for a career in the subject. A succession of teachers of varying competence in physics taught the few courses that were offered. The first was a Lutheran minister named Samuel H. Aughey who at least had the distinction of having worked under Joseph Henry at the Smithsonian Institution. Aughey, as one of only four faculty members at that time, taught all of the courses in chemistry, physics, astronomy, botany, and geology, and even some of the courses in German! The teachers of physics in the first 10 or 15 years were basically pedagogues rather than professional physicists. Teaching consisted of recitations by the students of material memorized from their textbooks; there were no lectures, discussions, or laboratories. DeWitt Bristol Brace arrives and things begin to happen. As the University grew, there began to be more specialization and under the enlightened leadership of some of the early chancellors several excellent scholars were added to the faculty. One of these was DeWitt Bristol Brace (at left) who came to Nebraska in 1887. Brace had been educated at Boston University and MIT. He then did graduate work under Henry Rowland at Johns Hopkins University and under Hermann von Helmholtz and Gustav Kirchhoff at the University of Berlin where he received his Ph.D.
During his one-year trial period, Brace taught six courses, most of them with new laboratories that he instituted. He probably spent at least 15 hours per week in the classroom in addition to 19 hours supervising the laboratories. At the end of the year, Brace was made a full professor and the chairman of the newly formed Department of Physics. Most of his next decade was spent building up the Department, adding courses, obtaining additional instructors, and finding more space to satisfy the rapidly growing student demand. Brace also began doing research at Nebraska, which continued the studies he had done in Germany on magneto-optical effects. The 3,400-pound electromagnet (above right) was built by Brace about 1888 for this work. The Electrical Engineering Department grew out of physics. The demand was partly driven by the swiftly increasing need for electrical engineers as cities all over the country were becoming electrified at that time and needed trained workers. Initially, the new subject of electrical engineering was taught in physics departments, the first such course being started at MIT in 1882. By 1888 Brace had also instituted a course of that type and more followed. 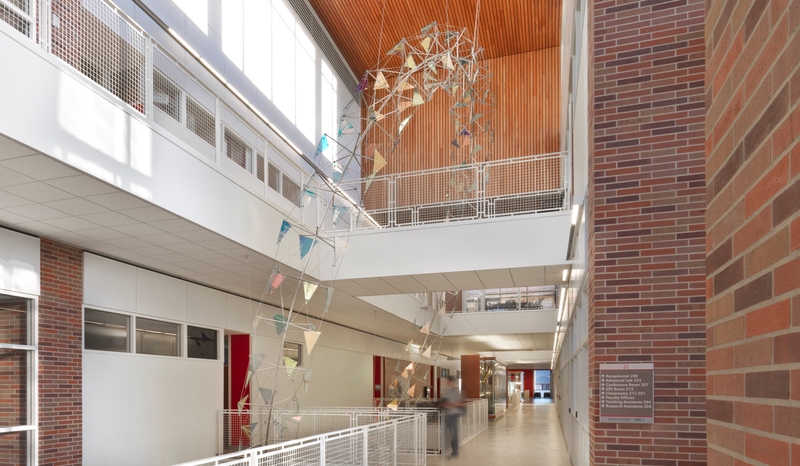 He oversaw the construction of an electrical generating and distribution system that supplied current for 16 arc lamps on campus and 200 16-candlepower lights which operated for three hours per day in the new library. He also found time to secure patents on three electrical devices. Eight of the first nine graduates in physics obtained employment as "electricians" or what we would now call electrical engineers. 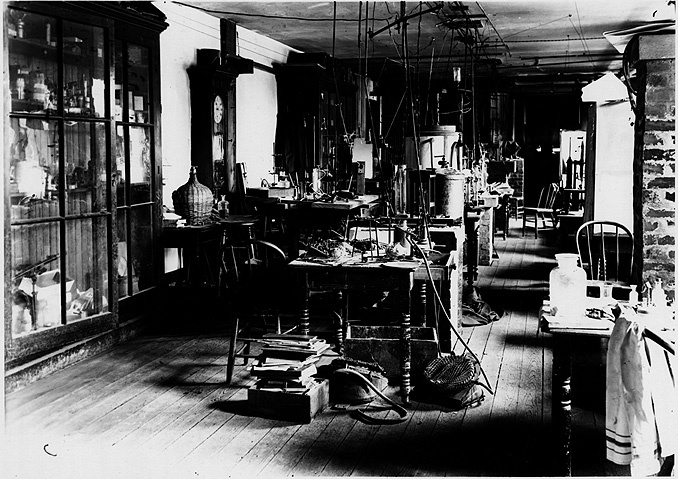 In 1895 electrical engineering was split off from physics and became a separate department. First Ph.D. west of the Mississippi. Brace also began building a graduate program and hired two additional instructors in 1896, Burton Evans Moore and Louis Trenchard More. A few years later Clarence Aurelius Skinner and John Edwin Almy were also added to the physics faculty. In 1896 one of Brace's students, Harold Allen, was awarded a Ph.D. degree by the University of Nebraska. This was the very first Ph.D. given by any school west of the Mississippi. 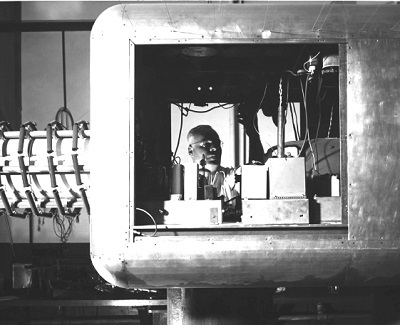 With one or two exceptions, no further Ph.D.s were given until the present Ph.D. program in physics was initiated after World War II. 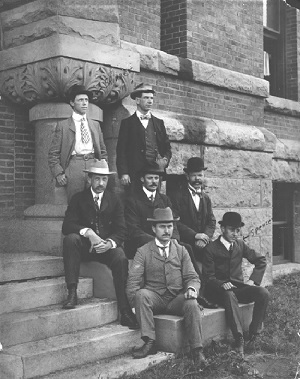 The photograph on the left shows members of the Physics Department in May 1905 in front of the old Nebraska Hall, which is where the Department was housed until it moved into Brace Laboratory later that year. Brace performs the most sensitive experiment ever done. 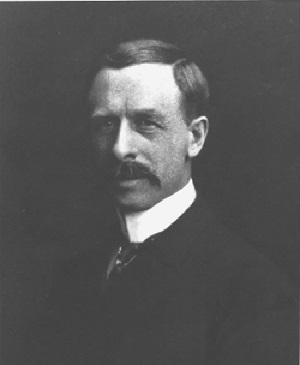 With the addition of two faculty members in 1896, Brace was finally able to find time to do research and he chose optics as his field of study. Light was understood at that time to be a wave phenomenon that was propagated through a medium known as the ether. But if there is such a medium, we should be able to detect it. A few years previously Michelson and Morley had reported their famous experiment which failed to detect the motion of the Earth through the ether. Lorentz and Fitzgerald sought to explain this with their suggestion that objects moving through the ether are compressed along the direction of motion. Among the experiments that Brace carried out were three additional ones that were designed to detect the ether. The best known of his ether drift experiments was the one on double refraction of light which was published in the Philosophical Magazine, a British journal, in 1904. In 1902 Lord Rayleigh had done such an experiment, his idea being that light polarized parallel to the direction of the ether drift would have a different velocity in a medium than one polarized perpendicular to that direction, thus causing the medium to be doubly refracting. Rayleigh was unable to detect any effect, but his sensitivity was not great enough to give a definitive result. Brace built an apparatus to redo the experiment with 150 times Rayleigh's sensitivity. By reflecting light back and forth through the medium several times, he was able to increase the light path to 30 meters. To detect the expected rotation of the direction of polarization he invented a new exquisitely sensitive polarimeter. With his apparatus he could detect a fractional difference of 7.8 x 10-13 between the two velocities. With this incredible sensitivity, which was more than 300 times greater than that of the Michelson-Morley experiment, Brace's measurement was undoubtedly the most sensitive ever made of any physical quantity up to that time, and few have exceeded it since. Did it influence Einstein when he developed the Theory of Relativity??? Brace, of course, detected no ether drift either but because of the extreme sensitivity of his experiment it was considered to be the definitive experiment. His result was quoted immediately by H.A. Lorentz, one of Europe's leading theoretical physicists, and also by Max Abraham. Edward L. Nichols, the founder of the Physical Review, said of Brace's experiments on the ether that they were to be "accounted among the greatest achievements in modern physics." Textbooks quoted his results for many years. Coming the year before the Theory of Relativity, Brace's double refraction experiment may have influenced Einstein's thinking when he wrote about "...unsuccessful attempts to discover any motion of the Earth relative to the light medium." The growth of the Department had led to overcrowding for many years and Brace lobbied hard for a new building. Finally in 1904 plans began to take shape and a site was chosen. Brace had to plan carefully so as to avoid infringing on the space used by the football team for its practice. Then, as now, the football program had a lot of influence at the University of Nebraska! A three-story brick building was built in the Vernacular Renaissance style. Laboratories occupied most of the ground floor. An amphitheater-style lecture room (left) seating 160 stretched from the second to the third floor. Since electric lights were just coming into use, combination gas and electric fixtures were installed. The building was completed about December 1905. Unfortunately, Brace, after years of working in inadequate quarters, was not able to enjoy the results of his planning. He died in October 1905 from blood poisoning resulting from an infected tooth. He was only forty-six years of age. The building was named "Brace Laboratory of Physics" in his honor. The Department declines during the Depression. The Department of Physics had reached a high point of excellence and recognition at the time of Brace's death. This was, in fact, true of the University as a whole. At that time the University of Nebraska was considered to be among the top four (or certainly the top twelve) universities in the country. After Brace's tragic death the Department carried on with C.A. Skinner as chairman. But it had lost its momentum and the research program began to decline especially after 1908. World War I brought charges of disloyalty against the University for teaching the German language. During the 1920s many universities experienced rapid growth while in Nebraska the legislative appropriations failed to keep up with the enrollment. In the 1930s drought and Depression affected the Midwest more seriously than the rest of the nation. University salaries were cut 10% in 1932 and another 22% the following year. Morale was at a low ebb. A succession of mediocre and uninspired chancellors failed to stem the overall decline in the quality of the University. In the 1940s World War II caused a drastic decrease in the size of the student body and very few male students were left on campus, further eroding its quality. Goodwin Swezey and the observatory that never was. The early teaching of astronomy was done by whatever teacher who had any science background but it became the job of the Physics Department after 1888. Brace purchased an excellent 4-inch Brashear refracting telescope in 1890. Also in that year, the Board of Regents authorized a regular course of studies in astronomy but it wasn't until 1894 that the University had a full-time teacher to teach those courses. This was Goodwin DeLoss Swezey who came from Doane College. At first he was appointed as Professor of Meteorology but was gradually shifted to astronomy and for the next forty years he was the only astronomy teacher. In 1896 he drew up plans for a small observatory which was built on 12th Street approximately where the Administration Building now stands. Later it was moved to 10th St near Brace Laboratory. By 1905 Swezey decided that the University needed a larger telescope and observatory. But lacking funds to purchase such a telescope, he determined to build one himself. He procured glass blanks and found a country doctor named Charles S. Minnich who agreed to grind the lenses for him. Minnich spent most of his spare time for the next year grinding the two components of the twelve-inch lens. Meanwhile Swezey designed an eighteen-foot telescope tube and the mounting and clock drive needed. Little by little over a period of eight years the Engineering Department at the University built the hundreds of parts needed. The photograph on the right shows the telescope under construction. Swezey then obtained authorization to build the observatory which he also designed to house the telescope. But before the bids were let, there was a cost overrun on the construction of another building and the Board of Regents cancelled the observatory plans! The telescope that Swezey, Minnich and others had labored on for so many years was never used. The tube, mount, and drive were eventually melted down as scrap and later even the precious lens was lost. Swezey must have been heart broken. After the 81 year old Swezey finally retired in 1932 even the Astronomy Department was terminated. The University wakes up again! In 1945 when WWII ended, large numbers of returning servicemen flooded back to the universities, anxious to finish their education and get on with their lives. Enrollment more than doubled between 1943 and 1946. A new chancellor, Reuben G. Gustavson, embarked on a program to add new buildings and to rebuild the faculty. Since physicists had shown their value to society by their important contributions to the war effort, research money began to be made available from federal sources and some members of the Physics Department were successful in obtaining funding for their research projects. Professor Theodore Jorgensen (above left) returned from his service on the Manahttan Project during the war and initiated a series of experiments with a 300-keV Cockroft-Walton ion accelerator which he built. Initially he and his students studied the relationship between the energy of ions and their range in various media and later began a fruitful series of measurements of the angular and energy distribution of electrons ejected in ion-atom and ion-molecule collisions. In 1951 Professor Robert Chasson (below right) started a program in cosmic ray research. His group made hundreds of Geiger tubes which he used to form cosmic ray "telescopes" which, with the help of multiple coincidence methods, could find directional effects of incoming cosmic rays. He had his laboratory in a room finished in the attic of Brace Laboratory. Solid state physics research projects were also begun about this time by Professors John Weymouth and Edgar Pearlstein. Sputnik spurs growth in physics. After 1957, when the Soviet Union launched Sputnik, the first artificial Earth satellite, the United States responded with a large scale effort to strengthen teaching and research in mathematics and science and embarked on a mission to put a man on the Moon. Following the national trend, the University increased the number of faculty members in physics at Nebraska from 9 in 1963 to 29 by 1973. Fourteen new professors were hired during the chairmanship of Edward Zimmerman from 1962 to 1966. 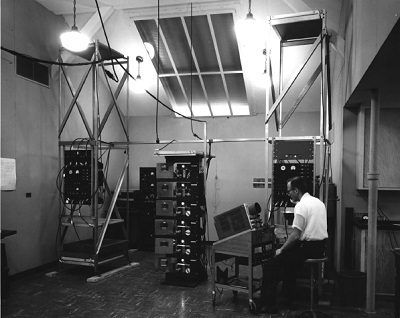 In 1964 a new building, Behlen Laboratory, was completed. 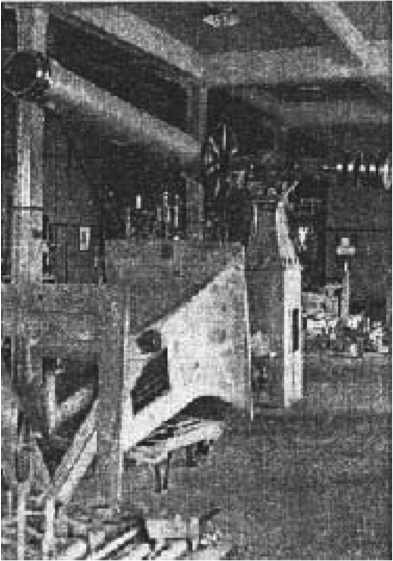 Funding for it came from Nebraska industrialist Walter Behlen and his family, augmented by a state appropriation and some federal funds. In the early 1970s the Department expanded further into part of Ferguson Hall. A big boost to physics came in 1969 with a Department Development Grant from the National Science Foundation for $811,000. This was spread over a period of three years and used to enlarge the faculty and the support staff and to purchase new equipment. This grant provided a strong stimulus to the research efforts of the faculty and further growth in the number of research grants and contracts resulted. The research expenditures of the Department have, on the average, doubled every six years from 1950 when the first grants were obtained, until 1990 and the new grants and contracts in physics and astronomy awarded in 1993 totaled over $4 million. A new astronomy program arises from the ashes. For several years after the demise of the Astronomy Department some astronomy courses were taught in the Mathematics Department but by 1960 they were dropped entirely. In the early 1970s the Physics Department under Henry Valk initiated a new astronomy program with four astronomers. Kam-Ching Leung, who came in 1970, developed undergraduate and graduate curricula in astronomy. A former Army ordnance building at the Mead Field Laboratory about 40 miles north of Lincoln was converted into what is now Behlen Observatory and in 1972 a 30-inch reflecting telescope was installed. The observatory facilities have been updated and now include full computer control and modern digital imaging technology. For further information consult the book Science on the Great Plains: The History of Physics and Astronomy at the University of Nebraska-Lincoln by M. Eugene Rudd, published by the University of Nebraska Studies in 1992. The Department also houses a collection of antique scientific instruments.